William Marshall Wheeldon, the son of Alice Wheeldon and William Wheeldon, a commercial traveller, was born in Bootle on 21st January 1892. Ten years later the family moved to 91 Stanhope Street, Derby where Alice ran a second-hand clothes shop at 12 Pear Tree Road. The Derby & District Directory records that she bought and sold the contents of people's wardrobes. 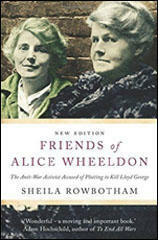 Alice Wheeldon became active in politics. She was a socialist and a member of the Socialist Labour Party (SLP) . She was also active in the Women's Social and Political Union (WSPU). Her children, including William, Hettie Wheeldon and Winnie Wheeldon, shared her left-wing political views. Alice brought up her children to be pacifists. On the outbreak of the First World War they all joined the No-Conscription Fellowship (NCF). On 31st August 1916, William appeared before Derby Borough Police Court charged with "wilfully obstructing police officers in the execution of their duty." The previous week he had attempted to stop the police move five conscientious objectors from the prison to the railway station. William was found guilty and sentenced to a month imprisonment. Over 3,000,000 men volunteered to serve in the British Armed Forces during the first two years of the First World War. Due to heavy losses at the Western Front the government decided to introduce conscription (compulsory enrollment) by passing the Military Service Act. The NCF mounted a vigorous campaign against the punishment and imprisonment of conscientious objectors. About 16,000 men refused to fight. Most of these men were pacifists, who believed that even during wartime it was wrong to kill another human being. Alice Wheeldon, John S. Clarke and Arthur McManus, established a network in Derby to help those conscientious objectors on the run or in jail. This included William who was secretly living with his sister, Winnie Mason, in Southampton. The Derby Mercury reported: "It was a lamentable case, lamentable to see a whole family in the dock; it was sad to see women, apparently of education, using language which would be foul in the mouths of the lowest women. Two of the accused were teachers of the young; their habitual use of bad language made one hesitate in thinking whether education was the blessing we had all hoped." Sylvia Pankhurst, writing in the Workers' Dreadnought, claimed that Alice was "mothering half a dozen other comrades with warm hospitality in a delightful old-fashioned household, where comfort was secured by hard work and thrifty management." She added that Alice was forced to close her shop but had "made the best of the situation by using her shop window for growing tomatoes." Alice Wheeldon's health never recovered from her time in prison. She died of influenza on 21st February 1919. William Wheelton, who was in Hylton Prison, was allowed out to attend his mother's funeral. William was released from prison in June 1919. He remained active in politics and joined the Communist Party of Great Britain in 1920. The following year he moved to the Soviet Union and settled in Samara, an industrial city on the Volga. In 1928 the Passport Office received an application from Winnie Mason for a passport so that she could visit her brother in the Soviet Union. In December 1929 William was recruited as a translator by the Executive Committee of the Communist International (Comintern). He was a strong supporter of Leon Trotsky and on 5th October 1937 he was arrested on the orders of Joseph Stalin. It is possible that Winnie and Alfred Mason were also arrested at this time. On 25th December the Military Board of the Supreme Court of the USSR sentenced him to be shot. The date this sentence was carried out is not recorded. 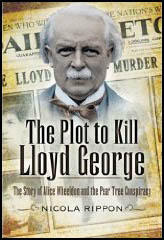 It is not known what happened to Winnie and Alfred Mason as their names completely disappear from history. I think it is a such a trumped-up charge to punish me for my lad being a conscientious objector... you punished him through me while you had him in prison... you brought up an unfounded charge that he went to prison for and now he has gone out of the way you think you will punish him through me and you will do it. Being a businesswoman I made a bargain with him (Gordon) that if I could assist him in getting his friends from a concentration camp by getting rid of the dogs, he would, in his turn, see to the three boys, my son, Mason and a young man named MacDonald, whom I have kept, get away.